Nendoroid Saber Lily Gets a Re-Sale! 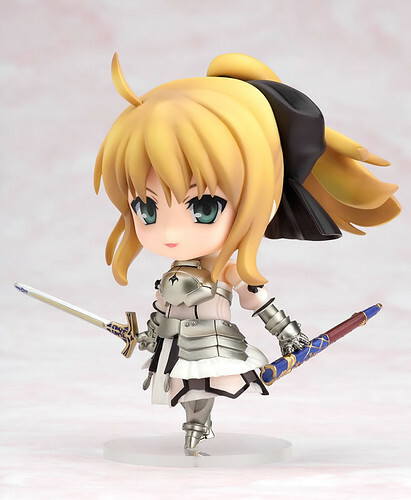 The pure white, royal knight – even more adorable as a Nendoroid. The ever popular ‘Fate/unlimited codes’ game series has expanded with the recently released PSP version, and to accompany its release is this adorable Nendoroid of Saber Lily! Of the many poses the Nendoroid is able to take, it can easily take the pose of its 1/7th scale counterpart, ‘Saber Lily ~Distant Avalon~ ‘, as well as the popular pose from the front cover of the limited edition of the PS2 version of the game. Excalibur, Avalon and Caliburn with its scabbard are all included as separate weapons, creating an almost endless number of posing possibilities! The super-deformed white knight from PS2/PSP game Fate/unlimited codes is priced at 3500 Yen and scheduled for October 2012. This entry was posted in News and tagged fate unlimited codes, nendoroid, saber, saber lily. I’m not a big Saber fan, but I like this version. I shall have to count my pennies and see.